The proposed foreign investment law will compel Chinese companies to step up independent innovation and industrial upgrading, which will ultimately bolster their competitiveness in the global arena, according to economists and business leaders who spoke on the sidelines of the two sessions. "We believe that the new planned foreign investment law can be an important, positive step for China," said John Litwack, World Bank lead economist for China. The draft law, set for a vote on Friday in the country's top legislature, has been warmly welcomed by the nation's industry insiders. They say while it will help foreign investors, it will also spur domestic companies to improve their competitiveness. 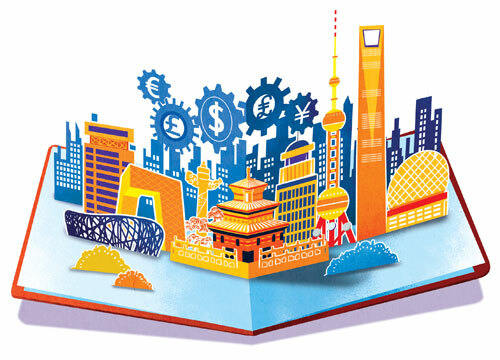 Li Daokui, an economist at Tsinghua University and a former member of the central bank's monetary policy committee, said introduction of the law will promote foreign trade and investment in China and enhance the country's attractiveness to foreign investors. That, in the long run, will fuel domestic companies to improve their independent innovation capability. "Foreign investors, just like foreign players in Chinese football clubs, will not only bring advanced skills and management expertise to China but also will help the country's domestic players to improve their ability in the end," said Li, a member of the 13th National Committee of the Chinese People's Political Consultative Conference. Shen Nanpeng, a CPPCC National Committee member and also founding and managing partner of Sequoia Capital China, said foreign capital, especially technology-intensive investment, will drive more domestic companies to push for technological innovation and high-quality manufacturing. Zheng Yuewen, vice-president of the All-China Federation of Industry and Commerce, said that as a private entrepreneur and chairman of petroleum equipment leader Creat Group Corp, he is "more excited than concerned". "Looking back in history, innovations and technologies always come from competition. Competition will be a stronger driver for a company to develop core technologies, so as to survive and win," he said. Liu Feixiang, a deputy to the 13th National People's Congress and president of China Railway Construction Heavy Industry Co, said, "On the other hand, the law is expected to channel more resources into the country, which will lead Chinese companies and industries to leverage overseas capital, technologies and talent on a bigger scale and at a higher level." More Chinese automobile companies already are mapping out their development strategy in foreign markets. Industry insiders say that is a good example of a sector that is accumulating global technologies and talent. Wang Fengying, an NPC deputy and vice-chairman and president of Great Wall Motor, said the proposed foreign investment law will directly help the country's automobile companies go global. "With the law, Chinese automakers will be able to cooperate with more global partners to integrate worldwide components and high technologies, laying a more solid foundation for us to make progress," she said. "The law puts the world stage right in front of us," said Wang Jianjun, general manager of the Shen-zhen Stock Exchange and an NPC deputy. In the latest draft of the law, equality has been made one of the top priorities, as it emphasizes that foreign and domestic companies will be "treated as equals". Zhu Jiandi, managing partner of BDO China Shu Lun Pan, a major domestic accounting firm, said the "legislation to protect the rights and interests of foreign investors is also an approach to protecting domestic enterprises from the perspective of international reciprocity".